How would you use data to strengthen the integrity and effectiveness of public procurement? We are looking for your best ideas in our Open Contracting Innovation Challenge. Apply now! Public procurement information can come in a lot of formats, from scanned, barely legible PDFs of government documents to rich, robust, standardized datasets. 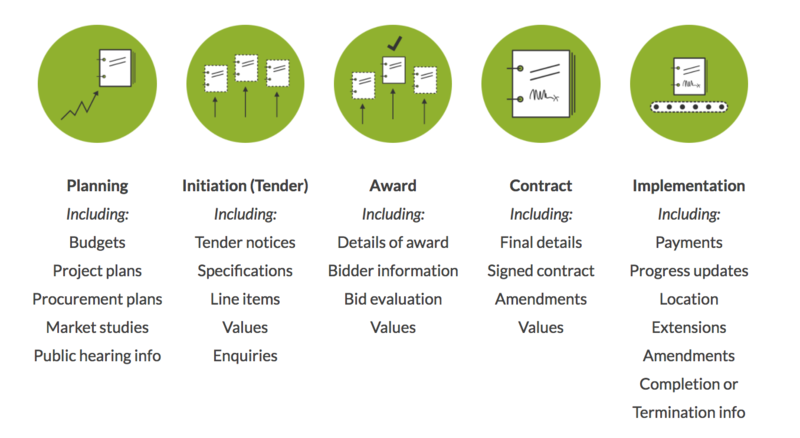 Whatever format this information comes in, it generally gives insight into the process or outcome of one or more phases of the public procurement process. But what happens at each of these phases in real life? Say, to build a 10 km highway extension in a small Latin American town. Let’s find out. Through this scenario, we’ll see a few concrete examples of potential data fields (in italics) during each phase. Let’s also consider how a civil society data activist might look at this information to run a number of analyses. Please note that this is a fictional example to illustrate one of the many potential applications of open contracting data. We hope this will provide you with some background – and maybe some ideas – for how procurement works and why it matters. There are a plethora of other avenues you could take to drive innovative solutions, so please do not feel limited by this singular illustration! Where project officials make decisions about what the project will look like, perhaps (hopefully?) including a budget, expected outcomes, and deadlines. In this example, the 10 km extension may be part of a larger highway project of the Transportation Department. Here, we could have information about the Project ID associated with the extension. The department may have allocated a Budget Amount and a Budget Source describing which part of their annual budget these funds will come out of. The department may also establish Anticipated Contract Start and End Dates and describe Intended Milestones and Timelines of the work to be done. Meanwhile, our civil society activist, Hack-tor, is interested in exploring these planning data to see exactly how his city is planning on spending taxpayer money throughout the coming year. He has taken a couple of statistics courses and has some open source statistical software on his laptop. His copilot on this quest is local journalist Manuela. She doesn’t know much about procurement, but figures that since she is aware of some of the pressing social issues at the local level, she might be able to understand why money is being spent on certain types of public works projects. They start combing through the City Public Works website to find PDFs of all the planning documents for the coming year. It’s hard to read the PDFs because they are often scanned copies of signed documents, and Hack-tor is a bit disappointed that there aren’t any datasets available that summarize that information. He’s resourceful, though, and writes scraper to extract some of the key data from the documents into a CSV spreadsheet. He later uses simple chart functionality to visualize the amount of budget pesos allocated to road projects, bridge projects, and water projects. It’s strange to Manuela that even though she knows the city needs far more road work, only a small percentage of all budgeted pesos are going to those kinds of projects. Hack-tor also compares the data with external information he found on the Budget Office website for the amount of pesos to be allocated to all city projects, and is shocked to find millions of pesos unaccounted for. They begin to wonder if these oddities can be explained by carelessness, or could they be the result of something more sinister like collusion or corruption? Where project officials release the details of the work to be done in a request for proposals from firms who would like to complete the work. Here, the department could set a Start and End Date for the tender process. They may also include a description of the Type of Procedure they will use to choose the construction firm (ie. will it be a totally competitive process? Or maybe the work is so specialized and complicated only a few potential firms could possibly complete the project, so it will be a limited process.) How will the department judge the applications that come in to evaluate which firm’s proposal is best? Probably through the Evaluation Criteria. There will also likely be information about the Technical Specifications of the work to be done in the attached Terms of Reference. On the firms’ end, we will get information about their organization, such as Business ID and identifying information like Address and Point of Contact. Their proposals will also likely include their Bid Prices. Manuela and Hack-tor are now hot on the trail of a story of misallocation of funds in their town. They look through the local e-procurement website and find a very basic database of all the tenders for the last year. There isn’t a lot of data in the dataset, just an associated project identifier, an amount, and a note stating whether the tender will be competitive or sole source. Hack-tor recognizes the project identifier as being the same one he saw in the planning documents and decides to link up that information, using the identifier as a key field which will allow for information matching. He runs a quick bivariate model, and is fascinated to see that for all sole source awards, the tender amount is far higher than the budget amount, as compared with the tender versus budget amount for competitive tenders. How strange! This is an interesting finding that seems to point to some sort of systematic overspending on sole source tenders. What’s happening here, the team wonders? Where the officials choose and announce a winning bidder (supplier) of the tender process. 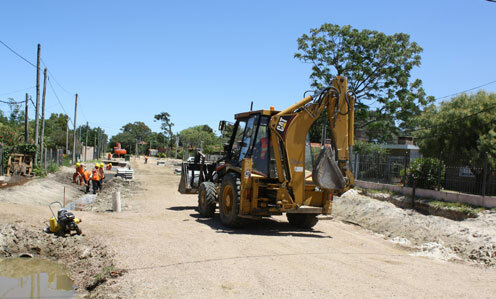 Here, Constructasaurus, Inc. has won the department’s tender for the 10 km road extension! We now likely have some more information about the process, such as Award Date and Amount Awarded. Because there is room for negotiation, however, these details will not be finalized until the next phase, Contract. Our local team of super sleuths is on the edge of their seat as they scroll through the e-procurement portal. Together, they see a clear pattern of overspending and decide to look into one specific contract. Because Manuela is an expert in capturing the public’s attention, she knows a well-told story can be more powerful than pages of statistical output. She finds a great contract: Constructasaurus, Inc. has been contracted through a sole source award to construct 10 km of road near her house. That’s strange: there are plenty of construction companies whose trucks she sees driving through her neighborhood who she bets would be fit to complete a simple, short road extension like this. Why wasn’t this process competitive, then? Furthermore, she recalls, the technical specifications from the tender phase were extremely short, which could signal that the work is not extremely specialized, and could, therefore, be completed by a large pool of potential suppliers. She keeps digging through the site to find more information about why this particular tender was sole source. Where the officials submit a formal offer to the supplier for their services. Constructasaurus, Inc. and the department have now sealed the deal. There may be information such as Contracted Amount and Contract Start and End Date. There may also be some information about Subcontractors who will engage in the construction work. Manuela is quite lucky; she is able to find a scanned PDF copy of the final contract given to Constructasaurus, Inc. The information looks very similar to that she found in the award phase. She takes a look at the signature line and her eyes pop as he notices something weird: the surnames of the authorizer from the department and the authorizer from Constructasaurus, Inc. are identical and quite uncommon. A quick internet search and peek at a professional networking site reveal that the two are actually cousins. That certainly does seem like a sign of conflict of interest. Maybe there is some information in the implementation stage to confirm suspicions of wrongdoing. Where the officials and supplier give information about the work actually being completed. Constructausaurus, Inc. is hard at work constructing the road extension, which gives us a wealth of information about the quality of the job. Ideally, we’d like to know if they deliver products and services on time, through fields like Date Milestone Achieved. We’d also love to know about Items invoiced throughout the project. And of course, the firm has to be paid; this would give us payment information like Amount Invoiced and Invoice Date. Manuela excitedly tells Hack-tor about her discovery. He finds a JSON file documenting all the payments related to public works projects in their town. He uses an online converter to convert the file into a friendlier CSV format. From there, he uses the project identifier to see that over half of the contracted value has been paid for the Constructasaurus, Inc. road project. Since the stretch of road is nearby, he hops on his bicycle to see the progress. He is shocked to see that not a single bit of what has been paid for has actually been constructed. Big red flag! This certainly looks like a suspicious project. The two decide to submit a formal complaint to the Anticorruption Bureau to investigate further. With a few open contracting datasets, some PDFs, and an inquisitive spirit, Manuela and Hack-tor have successfully planted the seeds for identifying and eventually combatting one of the most prolific cartels in their town. What are you waiting for? What’s your best idea? Join our Open Contracting Innovation Challenge now.